In the 1960s, high-fructose corn syrup became a ubiquitous sweetener of soft drinks and other foods. Fructose was believed to a problem-free sweetener as it did not raise blood sugar immediately and was even thought to be the perfect sweetener for those with diabetes for the same reason. Then, around the turn of the millennium, the infamous sweeter was identified as a prime suspect in the country's obesity epidemic. It's been on the decline ever since. More studies have shown that fructose raises insulin and blood sugar dramatically, but the effect is delayed by several days. Liver processing of fructose causes an increase of triglycerides, which, in turn, triggers distortions in all other lipoproteins in the bloodstream, leading to heart disease, build-up of visceral fat, high blood pressure, high uric acid levels and inflammation in the body. As high-fructose corn syrup extends the shelf life of foods and farm subsidies make it cheaper than sugar, it's added to a staggering range of items, including fruity yogurts, cereals, crackers, ketchup and bread. So high-fructose corn syrup is almost everywhere, unless there is a concerted effort to avoid it, it's difficult to consume it in moderation. Furthermore, it is believed that even when used in moderation it is a major cause of obesity, cancer, dementia, and liver failure. As consumers steer away from foods containing this harmful ingredient, food companies are also quick to react to the changes in consumer attitudes. FDA has allowed food manufacturers to disguise HFCS under a new deceitful name, "Natural Sweetener" so that consumers into thinking they are eating healthy sugars. The name of HFCS-90 has also been changed to "fructose". Regular HFCS contains 42 to 55 percent fructose, while HFCS-90 contains 90 percent. In other words, the food ingredient now called "fructose" contains even higher concentrations of HFCS. Corn Refiners Association's response to critics, "A third product, HFCS-90, is sometimes used in natural and 'light' foods, where very little is needed to provide sweetness. Syrups with 90% fructose will not state high fructose corn syrup on the label [anymore], they will state 'fructose' or 'fructose syrup'." Blatant food companies are smearing 100% natural labels on foods that are loaded with corn syrup. So read food labels carefully. Names used by sneaky manufacturers to conceal HFCS include maize syrup, glucose syrup, glucose/fructose syrup, tapioca syrup, agave syrup, fruit fructose, crystalline fructose and fructose. General Mills' Chex cereal is one such example. The front of the box clearly states that the product contains "no high fructose corn syrup" (HFCS), but you turn the box over to read the ingredient list and "fructose" is there. Thus, by using HFCS-90 as an ingredient, Chex can now declare itself to be high fructose corn syrup-free. And since fructose makes up the sugar content in fresh fruits, it sounds much healthier than HFCS. What a scam! 1) Products containing "fruit sugar" are marketed as healthy foods, but be careful, most of them actually contain high fructose corn syrup. More in Fructose Corn Syrup or Fruit Sugar? 2) High Fructose Corn Syrup sounds really healthy! But hold on, is there is more than meets the eye? 3) Know what you are putting into your body. It is refined fructose corn syrup and not sugar extracted from real fruits! 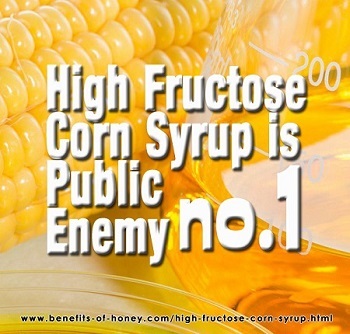 End of Public Enemy #1 High-Fructose Corn Syrup Given Image Makeover. Back to "Corn Syrup is Fine in Moderation?"